Erdinger Weissbier Wheat Beer is a popular Lager available from TheDrinkShop in 50cl to buy online. Visit TheDrinkShop for the best price for 50cl of Erdinger Weissbier Wheat Beer or compare prices on our other Lager products. Erdinger Weissbräu is a wonderful example of Wheat Beer from Germany that comes in the mid-way mark in the range of this style of beers. It is an easy drinking beer that is a great introduction to the style. It pours with a frothy head and the taste is of citrus and a slight floral hint. 5.6% abv. Where to buy Erdinger Weissbier Wheat Beer ? Erdinger Weissbier Wheat Beer Supermarkets & Stockists. 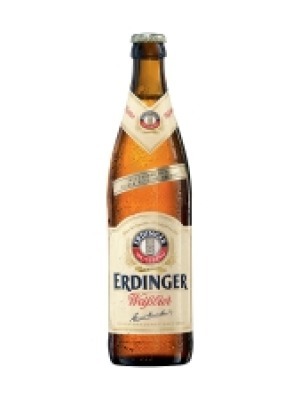 You can buy Erdinger Weissbier Wheat Beer online in most retailers and find it in the Lager aisle in supermarkets but we found the best deals online for Erdinger Weissbier Wheat Beer in TheDrinkShop, DrinkSupermarket.com, and others. Compare the current price of Erdinger Weissbier Wheat Beer in 50cl size in the table of offers below. Simply click on the button to order Erdinger Weissbier Wheat Beer online now.